Holiday apartment in Ipanema, the best and most attractive area of beautiful Rio de Janeiro. Important: no direct contact (view, close to, entrance to favela...). Little side view on the ocean, beautiful view on Ipanema and the twin peaks Dois Irmãos at the end of Leblon. Nicely furnished, close to the great restaurants of Ipanema. Ca. 200 meters to the pretty beach of Ipanema. If you want to go to Copacabana, the walk to the beach there is just a lit"General Osorio" in Ipanema. 24 hour door man. Masterbedroom with double bed, inbuild closet, ventilator/fan and air conditioning. One bedroom with two single beds, air conditioning and ventilator/fan. A little cabana with one single bed, also with fan/ventilator. Large kitchen with bartable and chairs for a coffee with a view in the morning. After your request I will send you a complete info pdf per e-mail. 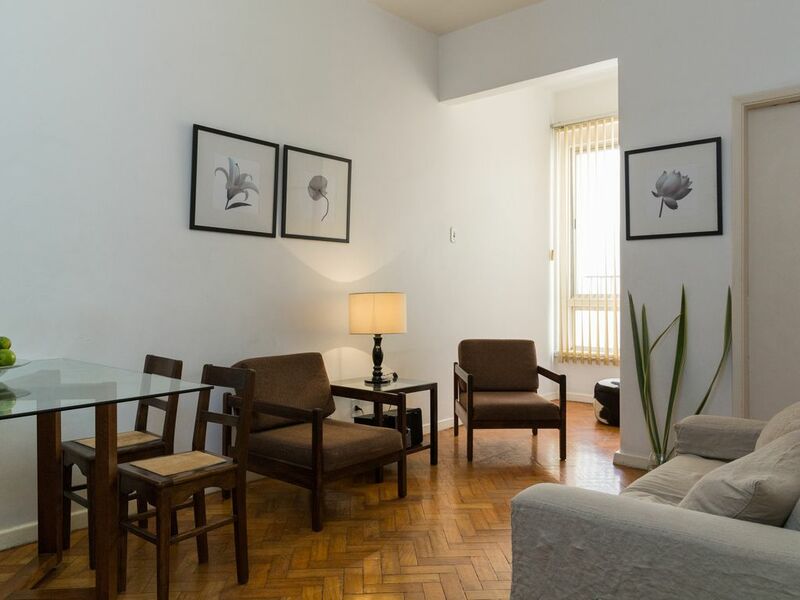 "I would like to recommend this very tastefully furnished apartment in Ipanema (close to Copacabana as well). For Rio standards it is not even very noisy. Bedding, linen, china, kitchen appliances etc. are high quality and we liked a lot hanging out at the apartment in spite of all the wonderful restaurants, movies, shopping etc. Ipanema is offering. Excellent location close to the (safe) Metro-line (for once you should take the backmost exit and take the elevator up to the new observation platform, where you will have a wonderfull view!) and to the beach. Claudio, who speaks very well English and who met us for the keys has been very kind and helpful at all times!" "The apartment is clean, tidy and very well located. Two blocks to Ipanema beach and three to Copacabana beach. Footsteps to supermarkets, restaurants, bars and amenities. One block to General Osorio square' subway station. Quiet area and excellent neighborhood. The apartment does not need anything to bring, just yourself and your luggage. Highly recommendable for shorter or longer stays!!" "Apartment is high up on the 8th floor but still very noisy, but then the location was great with metro, supermarket, bars, beach and restaurants all within walking distance. Apartment was dusty and could have been a bit cleaner, but overall the stay was ok for the price. Rio is a noisy city, so daresay everywhere is that way!" "Claudio, our charming host, is very friendly and helpful. The apartment is in a great spot, steps from groceries, shopping and the subway. It is a bonus to see the inside of a Rio apartment building and mingle with some locals. We would not hesitate to stay here again." "Since now I have rented this flat twice, second time with Homelidays (btw, a good tool for checking) . Friendly communication with the owner of the flat. The appartment now even has fast internet and wifi. Perfect for me as freelancer to do some of my job overseas. For those who like, air conditioning works well, though for me the fans (all rooms) are sufficient at all. Great beds, clean, and high quality, beautiful furniture, it does not look cheap at all. The manager, Claudio, is helpful for hints concerning bars, restaurants and nightlife. Definitively will come back, soon, I hope." "The apartment was in a wonderful location and had a fabulous view. It was very clean and had a really good use of space. The kitchen was fully stocked and overall it was a very homey place. I would definitely recommend it!" Transfer from the airport to the apartment for max. 4 people (mini van) can be arranged. Restaurants and bars in walking distance. Lagoa, the lagoon behind Ipanema for walking, biking, running, skating is ca. 10 min away. Botanical Garden, Hippie Fair (sundays at 100 meters away from the appartment). Supermarket and a cool wash saloon (wash club, with internet access – if you do not bring your labtop) in front of the house. All other expenses (electricity, gas, water, portero, trash etc. are included.) 100 R$ for final cleaning after you left are payable to the manager/caretaker before leaving. There is one bike that could be used. Please ask the manager if you are interested. Special price for New Years Eve (7 nights) and Carneval season (10 nights).